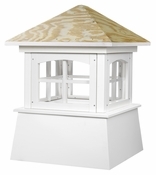 Our expertly crafted, made to order, Brookfield windowed cupola features timeless American styling. The Brookfield features a luan plywood hip style roof that adds an architectural element of beauty and lasting value to your home. Maintenance-Free, durable, Royal Brand PVC-vinyl with a wood roof that offers flexibility to shingle or cover in metal. Measures 18"Sq x 25"H. Square size measured at roofline. Measures 22"Sq x 30"H. Square size measured at roofline. Measures 26"Sq x 36"H. Square size measured at roofline. Measures 30"Sq x 43"H. Square size measured at roofline. Measures 36"Sq x 49"H. Square size measured at roofline. Measures 42"Sq x 58"H. Square size measured at roofline. Measures 48"Sq x 68"H. Square size measured at roofline. Measures 54"Sq x 76"H. Square size measured at roofline. Measures 60"Sq x 85"H. Square size measured at roofline. Measures 72"Sq x 101"H. Square size measured at roofline. Measures 84"Sq x 118"H. Square size measured at roofline.